Because of my posts about modifying microphones, I recently received an invitation to visit a proper mic designer. Les Watts is an engineer who worked for some VERY prominent microphone companies… I’m fairly certain that at least one of them is in your locker right now. Les lives about a three-hour drive from me, so I went by for a short visit recently. It was, of course, extremely educational. I brought along a pair of mics that I had doctored, and we tested them using his calibrated setup. The ADK SC-2 small-diaphragm condenser microphone. The stock mic is on top, the modified capsule is shown on the bottom. One of the things that I learned… or rather confirmed… on my trip is that real microphone design is a very slippery fish. A microphone is a true “complex system…” one small change affects a whole host of other factors. The mod that I did (not so much a design as a “I-wonder-what-will-happen-if-I-do-this” sort of affair) was to cut away the area in front of the mic diaphragm, leaving the area more open and less restricted by the grille and metal in front of the diaphragm. It turns out that the “cup” shape that is created by the area that I cut away forms a high-frequency resonator, which I’ve essentially removed. Sometimes this is a good thing, sometimes not. 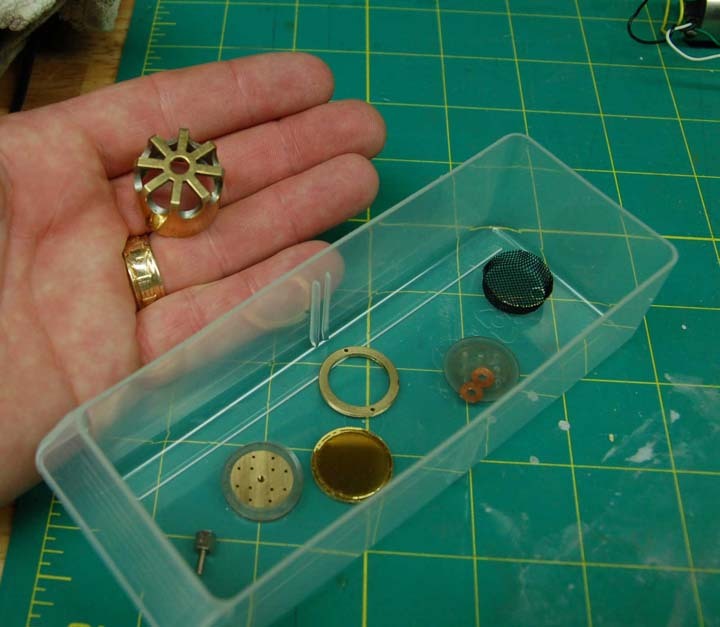 The ADK capsule shell disassembled for modification. 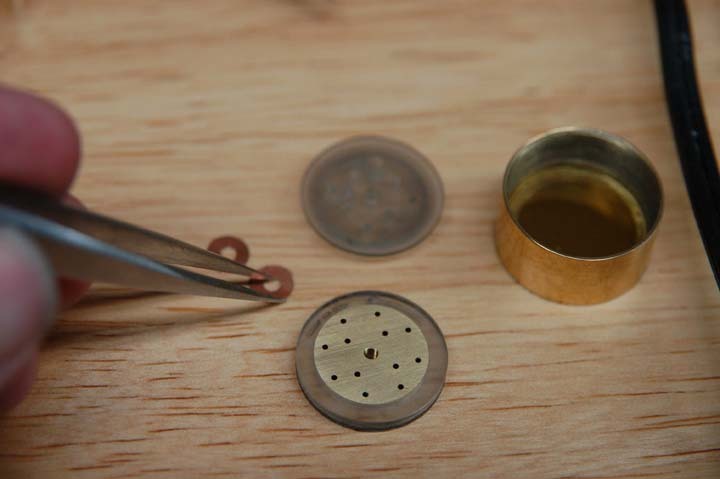 As you can see, a small-diaphragm capsule is a fairly simple affair with just a few parts. An important part that you can’t see is the spacer ring that lies between the diaphragm and the backplate. It’s a simple washer made from thin mylar film that looks much like diaphragm material… about 6 microns thick. Assembling the modified SC-2 capsule. Any dust trapped between the diaphragm and backplate will ruin the capsule. It took a few tries. 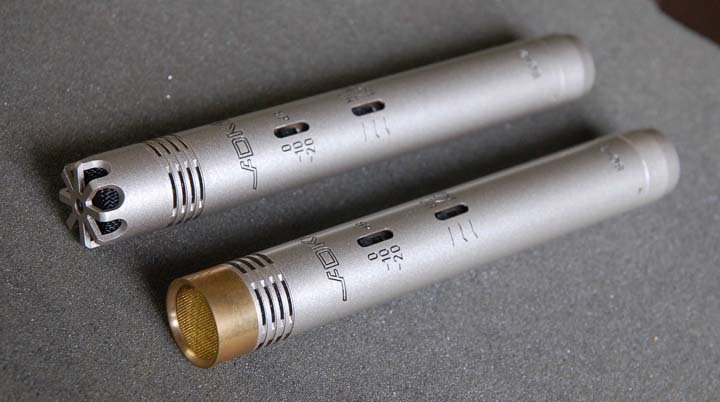 Consider the following two mic capsules. These are for some ADK SC-2 small-diaphragm condensers that I have. I had an extra pair of dead capsules, so I figured I could play around with these without much risk. (I did get them working again) The only change was removing the cage at the front of the diaphragm, lowering the height of the sides to about 2mm, giving the edges a gentle radius, and using a finer brass screen in front. First off, you should ignore the huge rise below 200 Hz, which is due to proximity effect of the test setup. 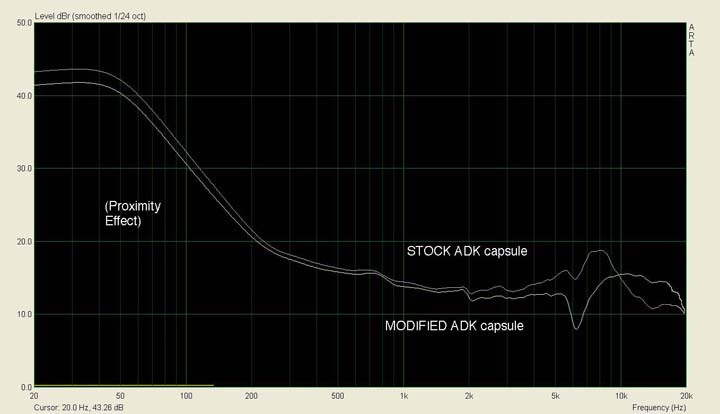 What I found interesting was the rise in response of the stock capsule centered around 8kHz. Les told me this is a pretty typical Chinese mic response. Looking at the lower of the two curves, we see that modifying the headshell does even out this rise, and gets us a slightly extended high end response… but it also introduces a pretty deep notch at around 6kHz. This notch is present in the unmodified capsule too, but to a lesser degree. This could be why the capsule shell was designed the way it was. Another take-home lesson from my trip is the need for a better testing setup at my studio. Remember, on guitar I could make out very little difference in the two mics. (I don’t have golden ears, but I have done a lot of listening.) Perhaps another recording of something with more transients, like a snare, might be more revealing. Again, according to Les, notches in a response of this sort are very difficult for the average person to identify in listening tests. What I could really use is a setup that’s similar to his. So I’m currently on the hunt for another inexpensive computer (this will be #4) that I can use with ARTA as a dedicated test machine. My son’s old Dell doesn’t seem to want to generate any video, but I may yet be able to get that one going. If not, it’s off to the thrift store for some computer shopping. I’ll also need a calibration mic and a speaker. The mic might not be too bad, and I may be able to borrow or beg this one. The speaker will be a little harder, though I do have a pair of KRK5s that might at least get me started. Lots more to come… stay tuned!